- Moosi Rani ki Chhatri is situated outside the main palace of Alwar (Rajasthan). 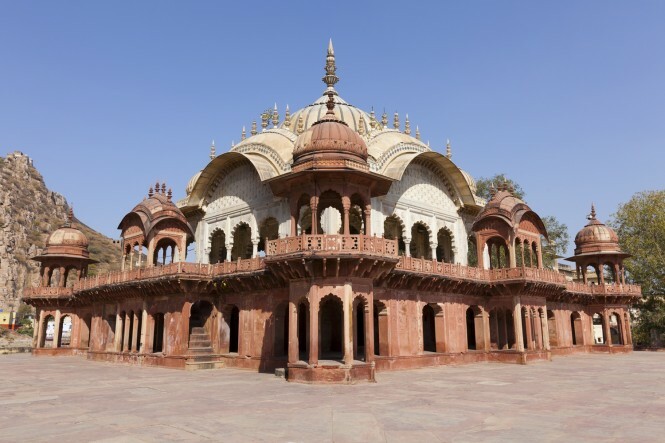 - Moosi Rani ki Chhatri is a beautiful red sandstone and white marble cenotaph of the rulers of Alwar. - Moosi Maharani ki Chhatri was built by Vinay Singh in the memory of Alwar’s ruler, Maharaja Bakhtawar Singh and his queen, Rani Moosi who committed ‘sati’. - The double-storeyed Chattari's ground floor is build by red stone while first floor is build by white marble. - Moosi Rani ki Chhatri is also known as 80 Pillars tomb / 80 Khambo ki chattari.